Like most other places where they celebrate Christmas, the Netherlands does tend to grind to a halt until the New Year. But what else should you be aware of about the festive season in the Low Countries? Here’s the traditional DutchNews.nl list of 10 key things you need to know about Christmas in the Netherlands. Tradition has it that Christmas trees don’t make an appearance in the Netherlands until after Sinterklaas, so as soon as the Sint has left, the tree sellers move in. 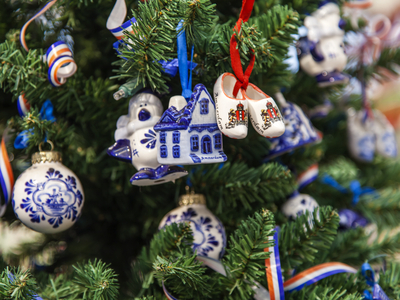 The Dutch love their trees – in fact they love Christmas decorations in general. The top floor of the Bijenkorf department stores are always worth checking out for the latest in tree fashions, with matching ribbons, table placements and mood candles. Christmas lights in the Netherlands tend to be in terribly good taste – lots of illuminated canal bridges and trees in gardens – but if you want tacky Santas, you can find them if you know where to look. Den Ilp, a little village north of Amsterdam, is famous for its over-the-top displays. One of the joys of being employed by a Dutch company is the annual kerstpakket (Christmas hamper) distributed to staff in the days before the Christmas festivities. Around four million people will get one this year, most of them worth around €40 – companies have to be careful otherwise you’ll end up paying tax on your hamper. Kerstpakketten used to be notorious for their tins of chicken ragout. Luckily, themes such as tea-tasting are on the increase, as are gift vouchers. The only time lots of people go to church. The midnight mass is usually a jolly affair of Christmas carols and lots of twinkling lights in a heated church (if you’re lucky) followed by a Christmas breakfast with lots of kerststol. The Stadsschouwburg theatre in Amsterdam has an alternative for people who want the experience without the religion. It used to be that the Dutch did not do presents at Christmas – which can be very embarrassing when you present your in-laws with a beautifully packed gift from under the tree. Nowadays, the great god of commercialisation is doing his best to make sure Christmas presents are catching on. If in doubt, ask. That good old Dutch bluntness has its advantages. The Dutch name for Father Christmas or Santa Claus. Definitely still a very poor relative to Sinterklaas and not really welcome. The Dutch don’t have a particular Christmas staple. The main meal can be anything from venison to mussels or rabbit stew but rollade – rolled up pork with herbs – is also very popular. The only real designated Christmas foods are kerstkransjes, the little biscuits tied to Christmas trees with ribbons, and kerststol, a delicious current bread with a little island of ground almond paste in the middle of each slice – unless you get the end bit. It’s traditionally crap. There’s no other way of putting it. Boring Christmas circus shows and boring films you’ve seen 100 times before. However, the advent of all those alternative streaming services means everyone can sit around in a stupor watching whatever they like. King Willem-Alexander’s address to the nation, recorded weeks before. Second Christmas day is the day you get to eat the meal all over again with your other family – if you have a partner that is. Otherwise known as vandalism. Most people hold on to their trees until most of the needles have worked their way into the carpet, pets and the grooves of the laminate flooring. When the trees are thoroughly dried out they are put outside (leaving what is left of the needles neatly spread on the stairs of your building) where they make excellent fuel for Christmas tree bonfires. In Amsterdam Noord they make a particularly spectacular one.